Being productive is not about your intelligence or your capabilities. It's about practicing certain habits in order to make the most out of the hours in each day. Here are 5 simple ways to improve your productivity. Some people are most productive in the morning, some in the afternoon and some in the evening and at night. The problem is, most people don't actually know when their most productive hours are. This article will help you work it out. Once you know when you work best, it's important to take advantage of these productive hours. Spend them working on large, difficult projects rather than smaller, easier ones. If possible, try to schedule your day around your most productive times, even if that means working from 7am - 3pm rather than 9am - 5pm, to avoid the afternoon slump. If you don't have this much flexibility, create a work pattern that suits you, taking breaks during your least productive times. Our brains are not designed to multi-task, despite what you may have heard. Unfortunately, multi-tasking is not even an effective time-saving strategy. When people are "multi-tasking", they're actually task-switching. When we switch rapidly between tasks, we're actually expending more energy, rather than less, trying to complete each of the tasks we're working on. We just end up doing both tasks badly. Focus on one task at a time. A possible way to do this is to make sure you handle each piece of paper on your desk only once. Avoid the temptation to change tasks if you get bored - persistence pays off in the long run. It's tempting to respond to emails as soon as they arrive, or to allow your colleagues to distract you with questions. However, once you're distracted, it's very difficult to refocus on your task. Politely let your colleagues know not to disturb you if you're working to a deadline. Make sure your phone is out of sight so you're not distracted by any alerts. If you're likely to be tempted to visit social media sites, use an app like Anti-Social to block you from visiting particular sites. Say no to unnecessary meeting invitations, or just attend for the agenda items that concern you (talk to the meeting organiser beforehand to find out when you'll be needed). Set aside blocks of time to check and respond to your emails rather than responding to them straightaway. Thoughts about work have a tendency to intrude on your home life, making it very difficult to switch off in the evenings and on weekends, especially when you're constantly reachable thanks to modern technology. To combat this, it's important to avoid work-related activities outside of work hours as much as possible. Don't take your work laptop home and don't use your personal mobile phone for receiving work communication. Once you've left work, if you think of work-related tasks, write them down. This way you won't forget about them and you'll find it easier to stop dwelling on them. Take the time to do things you enjoy doing outside of work. There's a lot of conflicting information about how much sleep you should get per night. Work out how much is best for your lifestyle and make sure you're getting that amount each night. Regular sleep helps you be more alert during the day, so you're better at problem-solving and making decisions. Ensure you're getting the same amount of sleep each night, whether that's 4 hours or 8 - however much you need to function effectively the next day. Maintaining a daily routine is important for our overall health and well-being - your body will thank you. 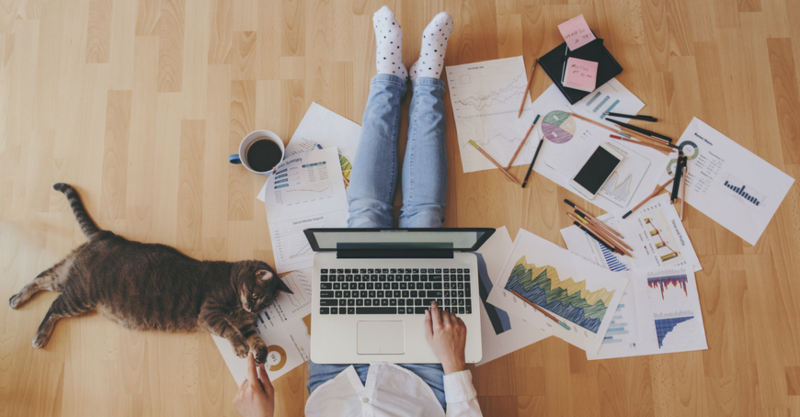 If you've been feeling like you're not as productive as you could be at work, these tips should help you make the right changes in your life to maximise your productivity, improving your life outside of work and your mental health at the same time. Read more: 3 ways to improve productivity in the workplace.